Despite a couple dozen protestors sporting “Make Ethical iPhones” signs, the mood at Apple’s annual shareholders meeting, held Thursday morning at the company’s Cupertino campus, was celebratory—both for shareholders in general and for some shareholder activists. The standing-room-only meeting attracted hundreds of shareholders, as both Apple’s campus auditorium and the first video-feed overflow room were full before the meeting’s 10 a.m. start time. The company used shuttles to take shareholders who didn’t fit in the first two rooms to an additional viewing area. As is customary, the first part of the meeting focused on official business—namely, the reelection of members of the company’s board of directors, and voting on a slate of other proposals, two from management and four from shareholders. 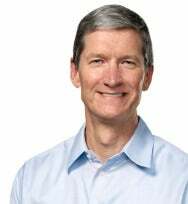 But even before that began, Bruce Sewell, Apple’s senior vice president and general counsel, announced a significant change in how the company’s board of directors will be elected. For a number of years, there have been shareholder proposals to require candidates for the board of directors to receive approval from over 50 percent of shareholders. (The current company bylaws allow a candidate running unopposed to be elected based on even a single vote in favor.) As is common in corporations, Apple’s board has routinely recommended against the approval of these proposals. However, Sewell announced that, based on preliminary voting results, Apple shareholders overwhelmingly want majority voting, and so the company is going to change its bylaws to honor that preference. Sewell also explained that because the change requires a number of modifications to the company’s articles and bylaws, the new policy will go into effect next year. However, he added that each current director had voluntarily agreed to resign if he or she did not receive the approval of a majority of shareholders. In the question-and-answer session later in the meeting, a representative from CalPERS (the California Public Employees’ Retirement System), the sponsor of the proposal, applauded the move, saying it was a win for democracy in corporate governance. None of the current directors was at risk of losing a spot on the board, however, as in preliminary voting, each received over 80 percent of shareholder support. Specifically, Tim Cook received 98.2 percent; Ronald Sugar, 97.9 percent; Robert Iger, 97.8 percent; Andrea Jung, 94.0 percent; William Campbell, 88.6 percent; Millard Drexler, 88.2 percent; Arthur Levinson, 84.0 percent; and Al Gore, 81.4 percent. Sewell also announced the results of preliminary voting for six other proposals (PDF link), with proposals approving of the current executive compensation report and the aforementioned majority voting passing; proposals on requiring conflict-of-interest reports, shareholder input on director pay, and reports on political contributions and expenditures failed. Before taking questions, Apple CEO Tim Cook spent some time reflecting on the previous year, noting that this was the first shareholder meeting since the passing of company founder and former CEO Steve Jobs. Thanking those in attendance for their support and condolences, Cook explained that Jobs’s death had an effect on everyone in the company, but that “sometime in the days after, that sadness turned into a determination to continue the journey” Jobs started. The iPod: Still over 70 percent of the market in the U.S., with nearly that in some other countries. For many shareholders, the highlight of the annual meeting is the question-and-answer period, where anyone can line up for a chance to ask a question of the management team—it’s one of the rare opportunities to see Apple executives interact publicly with people other than financial analysts. Though some people worried that protests, spurred by the controversy over working conditions at Apple’s China-based suppliers, might disrupt the morning’s proceedings, the roughly 25 protestors who showed up were limited to the public sidewalks at the entrance to the Cupertino campus. And inside the meeting, none of the questioners even mentioned Foxconn or factories, even in the context of how the controversy might affect the company’s financials. Indeed, of the seven or eight shareholders who had a chance to speak and ask questions in the short open-mic period, all were congratulatory, with only minor criticisms presented; this year, shareholders seem pretty satisfied with their lot, and were more interested in how Apple was going to continue its run of successes. Cook, responding to a former scientist’s request that Apple do more in education by sponsoring engineering and science scholarships: “We believe that education is a great equalizer.” The percentage of Apple’s matching-gift program going towards education is incredible—”it’s just a start, but it’s really good and it’s really big.” “I believe the contributions Apple will make to education will come from our products [such as iBooks Author] because they have a multiplier effect on students and teachers.” Cook also noted that last year, Apple provided over $750,000,000 in equipment and equipment discounts to education. Oppenheimer, also on the topic of education: Last summer was Apple’s biggest internship program ever, with more than 600 interns on the Cupertino campus alone and many hundreds more around the world. Cook, on the topic of a stock split: History shows that most stock splits don’t actually help the stock over the long run; in fact, because of additional transaction costs, it may hurt. However, the company regularly talks about everything that might be in the shareholders’ best interests, and will continue to do so.